Bay Lofts are where the action is in Sturgeon Bay | Vandewalle & Associates, Inc. 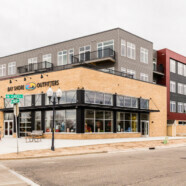 The first floor of the new development also houses the new location of the Bay Shore Outfitter, the second store for Sister Bay retailer selling and renting paddle craft and bike rentals. The new Bay Shore Outfitter location opens in early May, ready to serve Sturgeon Bay visitors and residents headed to the nearby Ahnapee Trail, historic Sturgeon Bay and Potawatomi State Park. Read the Door County Pulse article here.